The Austin Maxi is a medium-sized 5-door hatchback car that was produced by Austin and later British Leyland between 1969 and 1981. It was the first British five-door hatchback to be fitted with a five-speed transmission. The interior of a left hand drive French model. The Maxi (code name ADO14) was the last car designed under the British Motor Corporation (BMC) before it was incorporated into the new British Leyland group, and was the last production car designed by famed designer Alec Issigonis. Originally under BMC's plan for its new model range, which it had been developing since 1965, the Maxi was to have been called the "Austin 1500" on its spring 1969 launch, and a saloon version the "Morris 1500" was to follow in the autumn. However, upon the merger of BMC and Leyland the new management abandoned the four-door saloon notchback and developed the Morris Marina instead. The Marina, launched in April 1971, was a rear-wheel drive car available as a saloon, coupe or estate. The new chairman Lord Stokes decided to also change the hatchback's name to the Maxi in homage to the Mini of 10 years earlier. All Maxis were produced at the Cowley plant in Oxford, although the E-Series engines were made at a brand new factory at Cofton Hackett in Longbridge. It was launched in Oporto, Portugal, on 24 April 1969 in a blaze of publicity, being one of the first cars to appear on the BBC's new car programme Wheelbase, a forerunner to Top Gear (which debuted in 1977). It was also the first car to be launched after the creation of British Leyland. It was one of the first hatchback models to be produced in the world, and the very first in Britain; the five-door hatchback echoed that of the French-produced Renault 16, which was European Car of the Year following its launch in 1965; this type of car increased in popularity rapidly during the 1970s and during the 1980s it became the most popular type of car in most European markets. Underneath the Maxi's practical and spacious bodyshell lay an all-new front wheel drive chassis, which was interlinked with an innovative five-speed manual transmission, another rarity on family cars in 1969 and one which many manufacturers did not largely adopt until more than a decade later. The latter suffered from notorious problems with its control linkage, especially in early models which had a cable-operated linkage prone to cable stretch and other problems. These were noted by autotesters such as Vicar in Today's Driver (1969), who wrote: "This is probably a good idea that just needs a little bit of working on." This criticism actually came as a result of a road test two months before the car officially went on sale. The later rod linkage was less problematic. All models were prone to problems brought on by the "cogs in the sump" layout, whereby the gearbox and engine shared a common oil supply. The clutch oil seal was also prone to leakage. Power came from a 1485 cc, E-Series petrol engine which would later find its way into other British Leyland products such as the Austin Allegro. The 1750 and twin-carburettor 1750 HL models, added to the range in 1971, offered good performance by the standards of this era, with a top speed of 97 mph, while the smaller-engine version could exceed 90 mph. Despite the new platform, the Maxi's styling suffered from the decision to save tooling costs by carrying over door panels from the Austin 1800 "Landcrab", which gave the Maxi an unusually long wheelbase in relation to its length, coupled to the fact that the carryover doors made the Maxi resemble a scaled down version of the 1800 (and indeed, the Austin 3-Litre, which also used the same doors) - a design which was by then five years old, at a time when curvaceous American-inspired "coke bottle" styling (typified by contemporaries such as the Ford Cortina Mk III and Hillman Avenger) was very much in vogue, contrasting sharply with the Maxi's very obvious mid-1960s looks. Another styling ambition for the car was a four-door saloon version, to compete directly with the Ford Cortina. A prototype was built, badged as a Morris, but it was not put into production, since the booted extension made the Maxi almost the same size as the 1800 model, which itself was replaced in March 1975 by the 18-22 series models (renamed the Princess just months after its launch). In Australia owing to recently increased local content assembly tariffs which would have resulted in the Maxi being uneconomic to build, Leyland Motor Corporation of Australia developed in the UK the Morris Nomad effectively a hybrid, utilizing the Maxi's E-series engine/transmission and rear tailgate and fitting them to the then currently assembled Morris 1100 body. Ironically, for a short while the Nomad (under the Austin name) was exported to New Zealand and offered alongside the locally assembled Maxi. The Maxi featured a spacious interior, comfortable passenger accommodation, competitive pricing and reasonable running costs, but it was let down by a dull interior and poor build quality, although it was not as notorious for its failings as the Austin Allegro and Morris Marina were during the 1970s. The Maxi gained a host of similar new rivals during the 1970s, including the Volkswagen Passat (1973) and Chrysler Alpine (1975), although its best-selling rivals from Ford and Vauxhall did not adopt a hatchback until the early 1980s. One unusual feature of this car was that the rear seat back, as well as folding forward as in a conventional hatchback, also folded back. In combination with fully reclining front seats this gave satisfactory, if spartan, sleeping accommodation. Towards the end of the Maxi's life, in 1980, a lightly revised model was marketed as the "Maxi 2", although by now sales were declining and a new car to succeed the Allegro and Maxi was being developed - although its launch was being delayed due to extra investment being required to develop the Austin Metro, launched in October 1980. On 8 July 1981, the Austin Maxi's 12-year production run came to an end. Its replacement, the Austin Maestro, which also replaced the smaller Allegro, was introduced in March 1983. Shortly after the Maxi's demise, BL met the demand for a larger family hatchback by revamping the Princess and renaming it the Austin Ambassador, although this was a short-lived model which only lasted until 1984, when the Austin Montego was launched. This completed BL's rationalisation, as it now had just one model competing in this market sector, five years after offering four similar-sized cars. The Maxi production lines at Cowley were turned over for production of the Triumph Acclaim, which was launched in September 1981. Despite its practical design and remarkable space efficiency (it is shorter, narrower and lower than the sixth generation Ford Fiesta), the Maxi never came close to reaching its projected sales targets. BL management decisions involving the Maxi had significant knock-on effects to the rest of the car line-up. BL marketing decreed that the Maxi should be the only car in the range to feature a hatchback. This stance prevented the Morris Marina, Austin Allegro and Princess models gaining hatchbacks despite those designs all being capable of receiving them. The policy was discontinued with the arrival of the Rover SD1 in 1976 and the fast-growing popularity of hatchbacks during the 1970s and 1980s saw British Leyland launch a raft of new hatchback models. The Austin Metro, launched in 1980, was only available as a hatchback, as was the 1983 Austin Maestro, which itself formed the basis for the Montego saloon and estate launched shortly afterwards. Although the Rover SD1 was only ever produced as a hatchback, its successor (the Rover 800 Series) was sold as a saloon and a hatchback. On 1 July 1969 John Lennon crashed a white Maxi on the single track A838 road near Loch Eriboll in the Highlands of Scotland. He was on his way to visit his uncle in Durness with Yoko Ono, his son Julian and Yoko's daughter Kyoko. Originally they had set off from Tittenhurst Park, his country home near Ascot in his Mini Cooper, however it soon became apparent that it was too small in which to drive all the way to Scotland, so they stayed overnight at his relatives' home in Liverpool where he rang Apple Records and arranged for a driver to bring the "staff" car, a recently acquired Snowberry White Austin Maxi registered RLA668G  It featured a full length white webasto roof and also had a silver apple mounted on the radio speaker top of the front fascia. Next morning Yoko and John transferred all their luggage over and his driver took the Mini back to Tittenhurst, and the four set off north again to Northern Scotland, stopping briefly in Windermere and Edinburgh. It was whilst driving the narrow A838 road that John panicked when he saw another car approaching him and sent the Maxi headlong into a ditch. While the children escaped relatively unhurt, John received a gash to his forehead and Yoko injured her back, resulting in a hospital stay in Golspie's Lawson Memorial Hospital for five days where he was treated by Doctor Michael Simpson. After they returned to London, John arranged for the Maxi to be placed on a plinth outside his Tittenhurst home as an homage to their luck, where it stayed for the next few years, during which time Julian took the silver apple from the dash and kept it as a keepsake, though it was auctioned many years later, also John had its steering wheel removed and it was hung up in his billiard room in the house. When John and Yoko finally left the UK for New York City, John sold Tittenhurst to Ringo Starr who immediately had the Maxi crushed. Also in 1969 Mars Confectionery UK ran a competition entitled "Maxis from Mars" where a number of white Austin Maxis were driven around the country with numbers on the doors. If the number inside a Mars bar wrapper matched the Maxi a customer would see driving around, then he or she won the car. One lucky winner in Corby was so happy with winning one that the prize Maxi still survives to this day. In 1972, a married couple escaped the Soviet quarter of Berlin at Checkpoint Charlie in the back of a Maxi. Once over into the western sector, the British Royal Military Police and the West German Polizei were so surprised that two people could fit into a Maxi's boot, that it was then taken up by Leyland West Germany and re-created in a television advert shown across West Germany, Switzerland and Austria. Also in 1972 at the Earls Court Motor Show a competition was staged by The Daily Telegraph, the Institute of British Coachbuilders and Motor Manufactures (later incorporated into the Society of Motor Manufacturers and Traders) to design a futuristic concept car based on a Maxi. The winning design was done by young talented designer Chris Field, and the prize was to have his design on paper turned into reality. The "Aquila" was constructed by Woodhall Nicolson, of Halifax with help from Lucas, Smiths (Motor Accessory Division & Radiomobile) and Triplex. The resultant car was then exhibited at the 1973 show and then given to Field. He then went on the design speed cycles with help from Lotus and his designs for high speed cycles have been used through subsequent Olympic teams. The car itself still survives at Poole in Dorset. In 1975 Dunlop Tyres, keen to prove its new "Worldbeater" tyre range, drove two white Maxi 1750HLs around the globe, visiting Europe, the Middle East, India, Australia and through the USA. Upon their return to the UK, Dunlop made an advert featuring a similar Maxi using some footage shot on the trip, in which the wife says to her husband that she is "popping down the shops" while he watches the Saturday afternoon sport. She then proceeds to drive the Maxi onto a hovercraft and go past the Eiffel Tower, across Saint Peter's Square, along the Saudi Highway and on to the Taj Mahal. She then walks back into the house, while the football results are on, carrying exotic Indian shopping and her husband looks on in surprise. From 1975 until 1980, British Leyland supplied the Lawn Tennis Association every year with official "Wimbledon" Maxis. These were standard single carburettor 1750s but fitted with HL velour seat trim and extra sound proofing. Afterwards they were sold through local Surrey dealers as ex-demonstration cars. In November 1979 during the Islamic Revolution in Iran, Martin Williams, the First Secretary at the British Embassy in Tehran, rescued five American diplomats who had managed to escape the stormed US Embassy, in his own private British registered orange Maxi complete with its GB sticker. Once rescued, the diplomat then discovered that the British Embassy had now also been overrun, and so undertook a treacherous drive across Tehran to the north of the city to the British compound of Gholhak. Once at Gholhak, the British diplomats and families smuggled the Americans in the Maxi again to the home of a Thai cook who worked for someone at the US embassy. Ten days later they moved on to the home of the Canadian number two diplomat from where the CIA hatched a plot to rescue their diplomats using Canadian passports and posing as movie makers. This was the basis for the US film Argo (2012). However, in this dramatization, the British role (and subsequently the Maxi's) were written out, as director Ben Affleck stated he wished to make the escaped diplomats look helpless and desperate to the studio audience. In Christmas 1995 Paul Smith Mail Order issued a catalogue featuring a Sandglow Maxi 1750. Entitled "The 1995cc" meaning 1995 Christmas Collection, It was produced in the style of the 1978 Maxi UK Sales Brochure and featured winter woolen hats and scarves, leather driving gloves, wallets and designer watches. AC/DC singer and car enthusiast Brian Johnson cited the Maxi as the worst he'd driven: "Like a matchbox on steroids. The only reason you knew it was a car was 'cause it had a steering wheel. It was most basic form of frickin' transport." May 1969: Introduction of the Austin Maxi 1500 5-door hatchback with transversely-mounted 1485 cc E Series engine and 5-speed manual gearbox driving the front wheels, independent suspension with hydrolastic shock absorbers (often referred to as "The Cable-Change" models). October 1970: Revisions: redesigned front grille with centre badge, bodyside strips, gearchange rods (instead of previous gear cables), better sound insulation, new seat facings, all-new veneered wood dash design and smaller steering wheel. Introduction of the Austin Maxi 1750 with larger 1748 cc engine and revisions as for Maxi 1500. Assembly by IMV in Yugoslavia also commenced in 1970. 1971: Alternator fitted to all UK Models, revised direction indicator circuit, matt finish wood dash, 1750 now has its own gold/yellow chequered grill badge. 1972: Introduction of the Austin Maxi 1750 HL, with twin SU HS6 carburettor version of the 1748 cc engine, which gave a higher output of 91 bhp (68 kW) at 5250 rpm. Other additional features for the HL were 165 x 13 radial ply tyres, black grille with chrome upper and lower strips, with red "HL" motif fitted, red chequered front badge, front bumper under-riders, chrome exhaust trim, black rimmed hub caps, body coloured mouldings along the sides and rear, electric windscreen washers, 3 spoke-alloy steering wheel with leather-bound rim, padded vinyl dashboard, dipping rear view mirror, vanity mirror on passenger sun visor, front door pockets, simulated wooden gear knob and brushed nylon upholstery. 1973: Hazard flashers introduced on UK models. Also with the Austin/Morris 1800, there are body changes to the Maxi to simplify production and reduce costs (the A posts are no longer lead loaded). 1974: Optional 4-speed automatic transmission available on 1750 & (from May 1979) 1750 HL. 1975: Fuel tank enlarged, revisions to the rear squab bed adaption facility. All models now feature cigar lighter and heated rear window as standard. 1976: All export LHD Models now designated "Maxi HL" with specification similar to UK 1750 HL without twin carburettor or three-spoke alloy steering wheel. 1977: Austin name officially dropped  by BL under recommendation by the Ryder Report. Model now officially designated Maxi. The only subtle difference to the owner was the rear tailgate badge along with the handbooks, so general public and dealers unofficially still called it the same name. Dual circuit brakes now fitted to UK spec cars. 1978: All models now have hydragas suspension instead of previous hydrolastic system, and all models now feature electric windscreen washers. The HL loses its three-spoke steering wheel and a walnut finish dash replaces its padded dash. May 1979: Introduction of the Maxi 1750 HLS with walnut dash and twin carburettor 91 bhp (68 kW) engine previously restricted to the HL (HL now with the single carburettor and wood dash). All models now feature the same copper colored front grill badge, black wipers and door mirrors, the rear tailgate badge is now located below the trim line, also revised illuminated switches, cigar lighter and revised windscreen wiper control instrumentation. The 1500/1750 now have 'Marle' fabric seat facings replacing the previous PVC "basketweave" leatherette. Single rear foglight now fitted across the range. Dec 1979: Maxi 1500 discontinued. Aug 1980: Introduction of the Maxi 2 range in 1750 L, 1750 HL and 1750 HLS variations. All models feature new revisions including new bumpers incorporating indicators (front) and reversing lights (rear), new side repeaters, full cover plastic wheel trims and broader side moulding inserts. Inside the instrument bezels were now in matt black, the switchgear was also again revised, the headlight switch was now on the steering column and there was a choke warning light. The L replaced the previous Base model and added LM/MW push button radio, nylon trim, door bins, laminated windscreen and walnut veneer dashboard. The HL gained intermittent screen wipe, velour seats, tinted glass and extra sound insulation. The HLS gained a burr walnut veneer dashboard. However, LHD export Maxi 2s were still referred to as 'Austin' Maxis in sales literature, only one version being available, the single carburettor HL, though unlike the UK spec cars it did not feature a radio as standard. 1981: Chrome bumpers replaced by matt black. July 1981: Last Maxi 2 rolls off production line, its place at Cowley taken by the new Triumph Acclaim. The very last Maxi, a champagne L model, is now owned by the Gaydon Heritage Motor Centre. ^ a b Culshaw; Horrobin (1974). Complete Catalogue of British Cars. London: Macmillan. ISBN 0-333-16689-2. ^ "Autotest: Austin Maxi". Autocar. 130. Vol. (nbr 3821). 8 May 1969. pp. 8–13. ^ "The cars : Austin Maxi development story". AROnline. Retrieved 2012-04-08. ^ Adams, Keith. 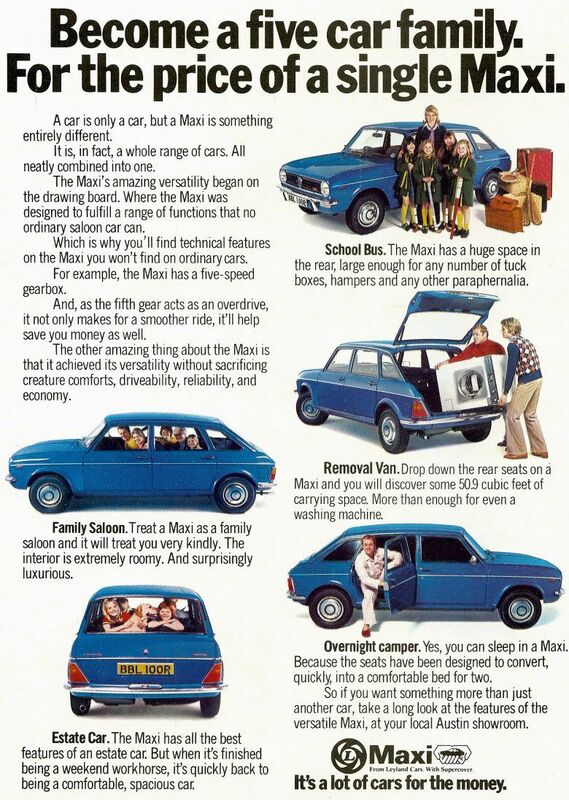 "Austin Maxi development history". AROnline. AROnline. Retrieved 15 May 2012. ^ "1972 Austin Maxi HL technical specifications". Carfolio database. Carfolio.com. Retrieved 15 May 2012. ^ "2012 Ford Fiesta 1.6 Hatchback technical specifications". Carfolio database. Carfolio.com. Retrieved 15 May 2012. ^ Barrett and Jacqui Goddard, David (20 October 2012). "Ben Affleck's new film 'Argo' upsets British diplomats who helped Americans in Iran". The Telegraph. Retrieved 21 October 2012. ^ "The best of the British car industry". AROnline. Archived from the original on 2012-07-18. Retrieved 2012-04-08. ^ Adams, Keith (2011-10-02). "Yugoslav 1100s". AROnline. Wikimedia Commons has media related to Austin Maxi.